Not many teams, regardless of the sport they play, go Down Under and come back triumphant. The Indian hockey team, however, bucked the trend as they returned home on Tuesday after thrashing the world champions 3-1 in the bi-lateral series. The Commonwealth Games silver, Asian Games gold, direct entry to Rio Olympics and now a rare series win against world champions Australia in their own backyard — this year’s successes suggest at a possible revival of Indian hockey. Viswanathan Anand pulled one back when it mattered the most and scored a crushing victory over defending champion Magnus Carlsen in the third game of the World Chess Championship. The Bombay High Court today dismissed a petition filed by the Cricket Association of Bihar (CAB) chief challenging two amendments brought out by BCCI in its rules allegedly to favour its president-in-exile N Srinivasan. Roger Federer produced another masterly display to beat Japan’s Kei Nishikori 6-3 6-2 and move a step closer to the semifinals at the ATP World Tour Finals on Tuesday. Indian tennis legend Leander Paes today replaced David Ferrer in the Punjab team of the Champions Tennis League. World No. 10 Ferrer withdrew from the league due to inflammation in his lower back. Paes will play men’s doubles with Somdev Devvarman and the mixed doubles with Spain’s world No. 22 Garbine Muguruza. Malaysia’s world No. 1 Lee Chong Wei has been provisionally suspended for an “apparent” anti-doping violation, the Badminton World Federation (BWF) said on Tuesday. Vancouver Lions warded off a stiff challenge from California Eagles to win 68-62 in their World Kabaddi League match here today. After this victory, Vancouver Lions bounced back in the race as they moved to 16 points with three more matches to come for them before the semifinalists are decided. The joy of beating the world champions was visible on the faces of the players. “It’s a huge achievement for us. Beating Australia in their backyard was never going to be easy, so we are thrilled to have done that,” said Ramandeep, the Indian forward. Much more important than what they have returned home with – joy and confidence – is what they have left behind in Australia – the fear of playing the mighty Australians. “There was always a nagging fear of playing against Australia... after having beaten them in their backyard, I think we will be far more confident facing them now onwards,” said Dharamveer, a midfielder. In their moment of triumph, one should of course not forget that Australia didn’t field their first choice players and at least five of their players made debut in the series. “That’s alright but all their players are equally good... it was a tough competition and we played really well after losing the first game to win the next three matches,” said Ramandeep. The players also felt that playing regularly against the Australian side will have long-term impact on the Indian hockey. “The regular bi-lateral series against the Australians is a step in the right direction and it’s going to help us a lot. We can learn a lot from them if we keep playing them on regular basis; our players have benefitted a lot playing alongside them in the Hockey League too,” said Ramandeep. While the players are obviously delighted, Roelant Oltmans, the high performance director, tries to curb their excitement. “It is surely a positive result for the team. Everyone in the world including Australia would not have thought of this outcome, although they are in the process of rebuilding after the World Cup,” said Oltmans. For him, the real test of the team’s strength will be facing Australia in the upcoming Champions Trophy. “If we are able to beat Australia in Champions Trophy, then we can say we have taken major steps forward,” he said. The young players, led by experienced Sardar Singh, are showing immense grit and determination on the field to bridge the gap with the top-ranked nations. A major credit must go to chief coach Terry Walsh and High Performance Director Roelant Oltmans — who have brought out the best in the team. Walsh might have threatened to resign from his post just days before leaving for Australia, but that bitter showdown with the Sports Authority of India did not distract him. The appointment of Walsh as the chief coach has brought a sea change in the Indian hockey, as pointed out by midfielder Gurbaj Singh. “Indian hockey might have had its ups and downs, but it’s on the verge of revival. The credit must go to Walsh for instilling confidence in the players that we can beat the world champions. He is one foreign coach who taught us to play as a unit,” Gurbaj told The Tribune. There were foreign coaches attached with the national side in the past — Ric Charlesworth, Jose Brasa and Micahel Nobbs — but, according to Gurbaj, they did not bother to develop the team as a well-knit professional unit. “The team is touching new heights under Walsh. We want him to continue till the Rio Olympics. We never played the sport as a team game under previous foreign coaches, but it’s different with Walsh. His coaching method and different training skill set are definitely helping the team to rise,” he said. Gurbaj said the Australia tour was a great learning experience for the entire squad and they would take the winning momentum into the Champions Trophy next month. “We played attacking hockey against them which was missing earlier. We used to play defensive hockey against them, they would build psychological pressure on us. But this time we paid them in the same coin, we countered them with our solid defence, man-to-man marking and attack,” he said. Having lost the second game of the match, Anand was almost in a must-win situation and the Indian ace came up with his best effort against Carlsen in recent years. Equalising the score on 1.5-1.5 after the third of the 12-game match, Anand also ended a four year drought against Carlsen as the last victory by the five-times world champion over the Norwegian had come way back in 2010 under this format. For the first time in his world championship matches against Anand, Carlsen went for the theoretical duel and was duly punished in a well-analysed variation. For the records, it was a Queen’s gambit declined by Carlsen, a natural choice with a full point cushion to back him. Anand went for a deeply-analysed variation and was pleasantly surprised to find Carlsen game. The players followed a 2013 game played between Levon Aronian and Michael Adams and it was Carlsen who did not seem to have kept the track of this game well. While going behind on time, Carlsen found the right manoeuvres but Anand was still well prepared. On move 20, a new idea was revealed by Anand which was a big improvement on the existing game in the position. Carlsen had to again sink in long thoughts intermittently during the rest of the game as one or the other problem was posed by Anand with a well-supported passed pawn on the seventh rank. Anand kept the momentum ticking without any further slips and piled on the pressure in almost Carlsenesque-style, giving the Norwegian a taste of his own medicine. 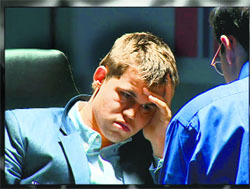 For once Carlsen was on the receiving end as he could only delay the inevitable. Making matters worse at this point was the clock that was ticking away and Anand sealed the issue after Carlsen made a blunder on move 28. Anand swapped a piece and it was all over in 34 moves. The HC ruling on the petition, filed by CAB chief Aditya Varma, could pave the way for Srinivasan to contest for president during elections in Chennai on November 20. A Division Bench headed by Justice Anoop Mohota refused to interfere with the decision of the BCCI’s general body in carrying out the amendments in its rules, saying the plea was based on presumptions and assumptions which cannot be considered by the court in a Public Interest Litigation. The Bench maintained the petitioner was a third party and not part of BCCI. Moreover, he was making allegations which were based not on his personal knowledge but on presumptions and assumptions which cannot be considered by the court. The six-times former champion was at his imperious best to subdue the 24-year-old US Open runner-up and will reach the last four should Canada’s Milos Raonic defeat Andy Murray in the day’s other Group B match. Although this year’s tournament is still to witness a three-set match, the entertainment served up by world No. 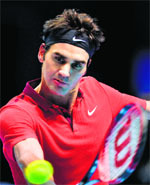 2 Federer and Asian trailblazer Nishikori kept the capacity crowd enthralled for one hour and nine minutes. Novak Djokovic began his challenge for a hat-trick of ATP World Tour Finals triumphs with a 6-1 6-1 demolition of Croatia’s Marin Cilic late on Monday. “I am very happy to be a part of Champions Tennis League, playing for the Punjab Marshalls. I am looking forward to a very competitive and challenging league format that will bring some of the best international tennis to different parts of the country. I look forward to playing with Somdev, Garbine and Greg, and together, I believe we will be a strong contender for the title,” Paes said. “The world-governing body has imposed this suspension due to an Adverse Analytical Finding of a sample taken at the BWF World Championships in August,” the BWF said in a statement. “The BWF has referred the matter to the BWF Doping Hearing Panel and, in due course, the Chair of the Panel will set the time, date and location of a hearing. The Panel will determine whether or not the athlete has committed an anti-doping regulation violation,” it added. On Saturday, the Badminton Association of Malaysia (BAM) confirmed that one of their players had tested positive for the banned anti-inflammatory agent dexamethasone but withheld the individual’s identity pending an appeal. Vancouver Lions warded off a stiff challenge from California Eagles to win 68-62 in their World Kabaddi League match here today. After this victory, Vancouver Lions bounced back in the race as they moved to 16 points with three more matches to come for them before the semifinalists are decided. California Eagles, who have 20 points, now cannot afford another upset in the remaining three games. Sukhbir Sarawan, captain of the Lions, played a pivotal role in his team’s hard-fought win and was declared the man of the match. Mikhail Jamaal waged a strong battle for California and was named the best stopper. In the second match, Royal Kings USA beat Lahore Lions 60-51. Nagpur: Rajasthan today suffered the ignominy of getting bowled out for a paltry score of 35 against Railways in a central zone leg match of the Vijay Hazare Trophy here today. Railways won the match in only 5.3 overs, losing a single wicket as the match lasted a total of 21 overs. This is the second lowest score by a team in the history of India’s domestic one-day competition. The lowest score in List A in India was Saurashtra’s 34 against Mumbai back in the year 2000. Rajasthan skipper Pankaj Singh opted to bat but the Rajasthan players strangely lacked the stomach for a fight as five batsman were out without scoring. Railways seamers Anureet Singh (5/16 in 8 overs) and Amit Mishra (5/18 in 7.3 overs) shared the spoils. The highest score was Arjit Gupta’s 13, which incidentally was the only double digit score. Abu Dhabi: Tom Latham struck his maiden Test century but New Zealand crumbled to 262 all out, conceding a 304-run first-innings lead as well as control of the first Test to Pakistan in Abu Dhabi on Tuesday. Left-arm pace bowler Rahat Ali claimed four wickets and spinner Zulfiqar Babar dismissed three New Zealand batsmen on a perfect third day for Pakistan. Pakistan were 15 for no loss at stumps. They will be without opener Ahmed Shehzad, who suffered a fractured skull in the first innings, for the rest of the match. Brief scores: Pakistan 566/3 & 15/0; New Zealand 262 (Latham 103; Rahat 4-22). Bilaspur: India batsman Yuvraj Singh on Tuesday officially launched his Centre of Excellence (YSCE) in association with the Himachal Pradesh Cricket Association. “I am thrilled to have finally launched YSCE here. The interest and amount of talent that the state possesses is outstanding,” said Yuvraj.